Two weeks ago we were spell bound by their dance performance in Bangalore. This weekend we took a day trip to their village to watch them practice and see where they live. The Nrityagram village is two hours from Whitefield, less-so from west Bangalore. Leave behind Bangalore and breathe in the fresh air. Whisper, don't break the silence. Follow the winding stone path under trellises and trees. Enjoy the sight of a small statue on a ledge or many scattered atop a grassy pitch. The dancers practice almost everyday when they are not touring. They are a dedicated group, committing themselves to the ways of village life and dance education...for years. They have toured the world. The three hour practice starts by taking the dancers through a series of seemingly effortless movements. After half an hour, sweat soaks their clothing and we begin to understand the difficulty and strength required to perform these unique movements. This day, five women and two men practice. Some are stronger and more experienced than others. They instruct, and help each other. 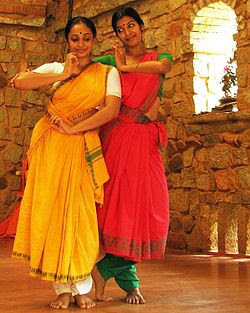 This type of Indian Classical dance is incomparable. I believe they train their brain to connect to every muscle in their body - to move independently of one another - that is how in touch with their body they are. At one point the instuctor spoke to two of the dancers, asking them to only move their torso: "left side up and down, right side up and down. Only move your torso, it is not necessary to move your neck or lower body." And then the opposite, "Move only your lower body without moving the upper. They do not have to be connected." And then she quickly stood up and demonstrated the movement with incredible ease, only moving her lower body - upper body still. Much emphasis is on the eyes and facial expression as the dancers are always telling a story. Fingers and hand movements, and every muscle follows along to do their part and create perfection. For much of the practice no music is played. The instructor sits on a low chair keeping time by hitting a smooth wooden stick on a stone block. She sounds out the rhythm with her voice, an unusual but captivating sound. The dancers live in simple surroundings, growing most of their own food. There is a temple, an outdoor yoga center, and of course the dance studio. They live in small round huts. The buildings are architecturally appealing, made of stone and wood. Flowering bushes and trees abound and add to the natural, calming ambiance. The public can watch the dancers practice Tues. - Sat. 10:30 - 1:30, and can watch the dancers teach children from nearby villages on Sundays. They are closed Mondays. Do phone ahead to make sure they are not touring.